Bent and Curved Glass Pty Ltd (BCG) has worked for many years with Enzie Stairs developing glass concepts for their innovative spiral stair systems. This stair, in an immaculately detailed architectural interior, represents the culmination of the increasing role of glass in elevating the finish for Enzies bespoke stair range. 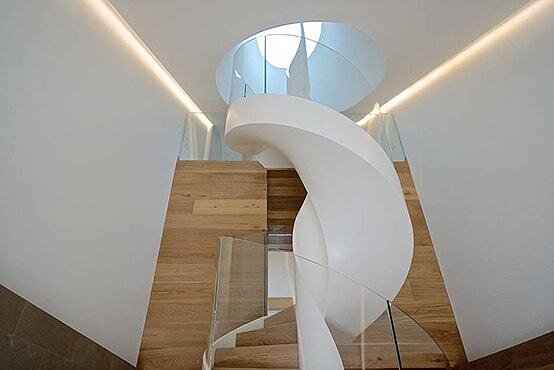 This stair is a centrepiece bringing a refined wow factor to the project designed by Carlos Correa of Archistudio Design. BCG’s fully frameless toughened structural laminated glass balustrade complements and highlights the unique sculptural form of the stair design. This glass makeup represents the trend towards this engineered solution which allows a compliant balustrade without the need for an interconnecting handrail or top rail. The incorporation of Low iron glass and concealed l.e.d. edge lighting takes the glass presentation to the next level, adding to a sense of openness, space and light. BCG’s technical skills in precision bending and laminating are on display in this tight radius spiral format. There is nowhere to hide with the fully exposed edges. Exacting edge alignment and finish and dimensional accuracy have met the highest standards required for this beautifully detailed project.